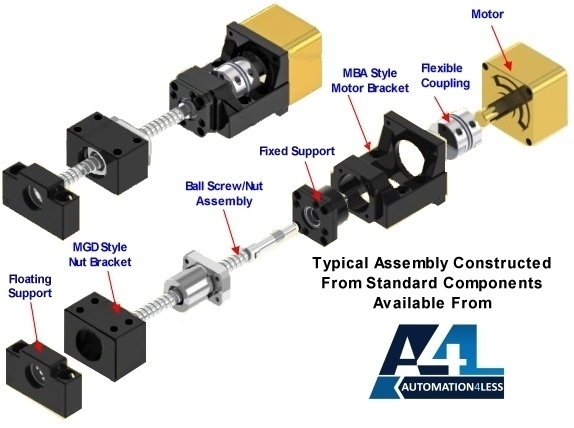 If you are looking for a simple and precise way to create a complete ball screw assembly, you've found it. Start with a standard ball screw unit (nut and screw) and combine with an MBA machined cast iron motor bracket, ball nut bracket, standard ball screw end supports and a flexible motor coupling. A servo or stepper motor completes the package. You end up with a great result...fast. And you eliminate expensive, tedious, slow-to-create custom machined components. As the diagram above shows, it's very easy to select the proper parts and bolt together. So how does it work? Start with your ball screw and nut. Depending on the screw diameter, everything else follows along. On the fixed end of the screw, there is an WBK (or FKA20 for MBA20 models) style fixed support. This locks your screw into place. 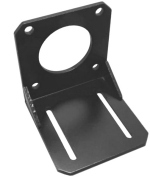 The WBK support then bolts to the MBA motor bracket that is sized to fit the frame of your motor. An inexpensive motor coupling (we offer couplings in a full range of sizes) is matched to fit the end of the ball screw shaft and the motor shaft. We offer MBA motor brackets that are compatible with virtually all common motor frame sizes. To complete the assembly, choose the MGD or HD nut bracket that receives the barrel of your ball nut. Pre-drilled and tapped holes in these brackets align perfectly with mounting holes in your ball nut. Other tapped holes in the MGD or HD bracket allow you to easily connect to the work you want to move. Finally, a standard BF floating end support keeps that end of your ball screw aligned. Often used in conjuntion with the MBA motor brackets featured on this page. CLICK HERE...for introductory information and technical data for the MGD and HD style ball screw ball nut brackets. CLICK HERE...to view these items in our online store.